Our shuttle is available to transport guests to all location within a 3 mile radius, which includes almost everything you need to see in downtown Denver! Free parking is also available! This all private room property offers rooms sleeping 1 - 4 people for affordable prices. 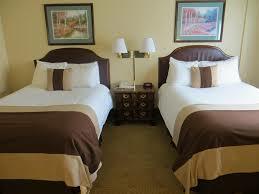 Hotel amenities include free wifi, fitness room, outdoor pool and restaurant on site. 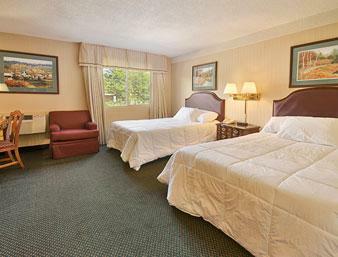 Take a look at our pictures to see our the cozy rooms that offer you clean and comfotable accomodations! 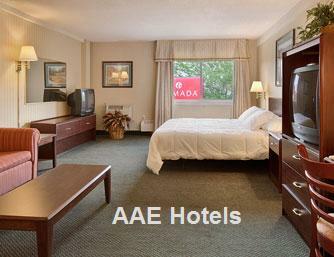 Nestled in the Capital Hill neighborhood of downtown Denver, The AAE Denver Ramada is 2 miles or less from all major attractions: Cherry Creek Mall, Colorado Convention Center, Coors Field, Pepsi Center, 16th Street Mall, Denver Art Museum, Colorado State Capital, Denver Zoo, etc. Situated near Cheeseman Park, City Park, Civic Center Park, the Cherry Creek Bike Trail and Confluence Park allows our guests to enjoy the city and the outdoors at an affordable price. Ask our concierge about discounts given to Ramada Downtown Denver guests from other local businesses. 14.5% tax is not included in the rates listed above and will be added to your total due at check-in. All guests must cancel 48 hours in advance via email or they will be charged the first night. I-70 West to Colorado Blvd exit. Go south to Colfax and turn right. Go 2 miles and hotel is on the left. I-70 East to Highway 6 east to Downing. Turn left on Downing hotel is on the right. Pena Blvd to I-70 West to Colorado Blvd exit. Go south to Colfax and turn right. Go 2 miles and hotel is on the left.